We’re first introduced to Angel Eyes (Van Cleef), who’s one mean mutha. Sent to find information on the location of stolen Confederate gold, he kills his informant, then kills the man who hired him, and begins his search for “Bill Carson”. Meanwhile, bounty hunter ‘Blondie’ (Eastwood) turns in the bandit Tuco (Wallach) for reward money. Tuco is wanted for a laundry list of nefarious deeds and sentenced to hang. But at the hanging, Blondie shoots the rope, freeing Tuco, and the two escape, forming an alliance to scam the law with their rope trick. Blondie gets sick of Tuco’s bitching and ends their partnership by abandoning him in the desert. Tuco survives, and reunites with his former gang members to kill Blondie. The pistoleros are no match for Blondie and all wind up dead, but Tuco sneaks in from behind. The bandit forces Blondie to wear a noose and stand on a chair, just when the Union Army decides to bomb the town, sending the rooming house crashing in a heap. Blondie escapes, but Tuco catches up with him and forces the bounty hunter to walk across the scorching desert without food or water as he sadistically lords over him. Just when Blondie’s about had it, a six-horse coach comes careening across the desert landscape. Curious Tuco stops the runaway horse and finds the coach full of dead Confederate soldiers. Not one to waste an opportunity, he lifts the corpses’ wallets and watches, only to discover one of them’s still alive. It’s “Bill Carson”, who tells Tuco the name of the cemetery where $200,000 in gold is buried. Tuco goes to get “Carson” some water, but when he returns the man is dead. However, Blondie has managed to crawl over, and now is the only person alive who knows the name of the grave where the gold is hidden. The two mortal enemies are now partners again. Donning the Confederate uniforms, they make their way to a mission run by Tuco’s brother, where Blondie can convalesce. The pair then hit the road, but are captured by Union forces and sent to a POW camp. 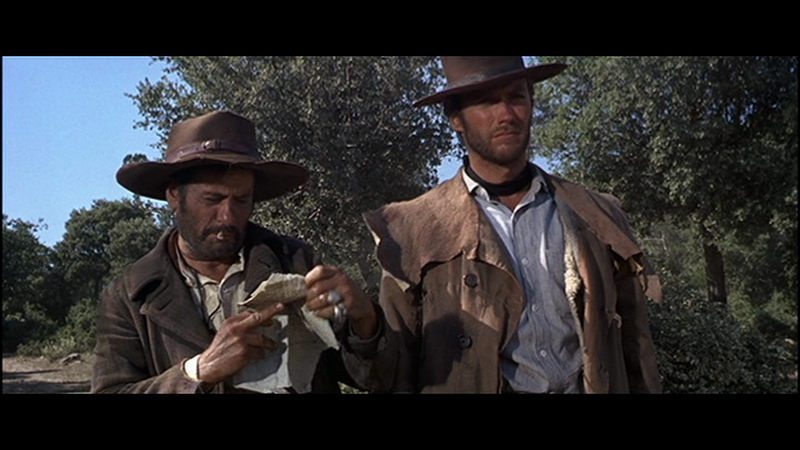 Tuco has taken the identity of “Bill Carson”, which sparks the interest of the camp’s sergeant…. Angel Eyes! Eli Wallach totally steals the show as Tuco. A foul-mouthed, feral animal who’s not as dumb as he looks, Tuco is alternately funny and cruel, sly as a fox and twice as dangerous. Wallach has a field day in the role, and the character is more fully fleshed out than either Eastwood or Van Cleef’s archetypes. The scene where Tuco is bathing when a bounty hunter tries to take him by surprise, delivering the line “When you have to shoot, shoot- don’t talk!”, is a classic, as is the one with Tuco in the gun shop. Wallach wasn’t even nominated for the Supporting Actor Oscar (Walter Matthau won for THE FORTUNE COOKIE), but the film itself wasn’t released in the U.S. until 1967. That year George Kennedy won for COOL HAND LUKE, but Wallach should’ve been a shoe-in either year. And yes, I still have the 45 lying around somewhere in the basement! 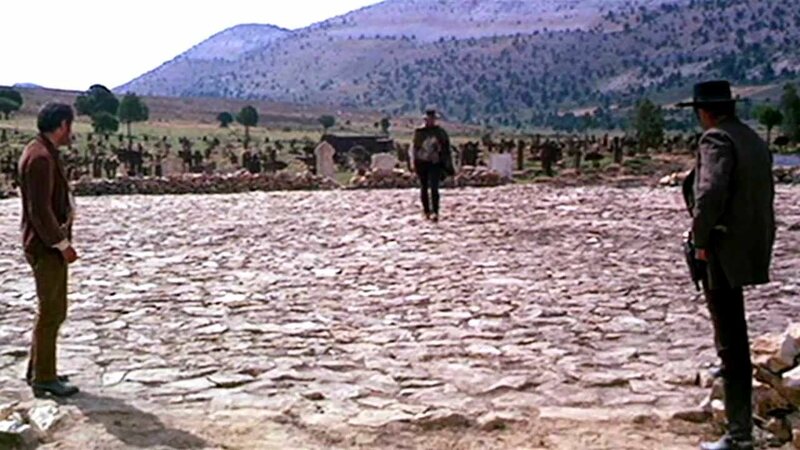 Sergio Leone’s THE GOOD,THE BAD, AND THE UGLY never gets old. I watch it a least once a year, and always marvel at something I didn’t quite pick up on before. Even if you’re not a fan of Spaghetti Westerns, the film transcends the genre into cinematic art by one of the screen’s true masters. Now if you’ll excuse me, I think I’ll go downstairs and look for that 45…. Superb review, I’ve enjoyed all 3. An absolute classic which brings so many memories with it. I do so need to watch it again soon and need to see it this time on Blu-ray. I have the LP on my shelves. Ennio Morricone’s soundtrack is beautiful. The deep, sad and emotional “The Death Of A Soldier” to the triumphed final piece showdown piece “The Trio”. The film and music are so perfect. Great nostalgia. I really enjoyed reading all three of your reviews for the Sergio Leone trilogy. 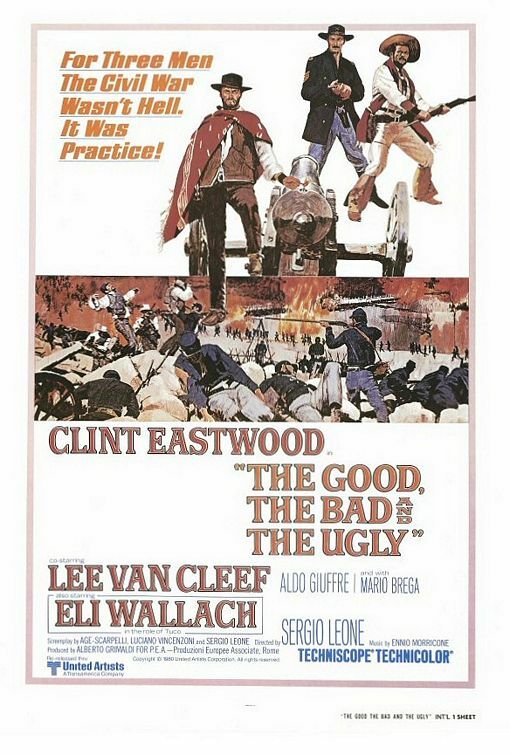 The Good, The Bad and The Ugly is definitely one of my favorite westerns of all time and in my opinion the most memorable sound track in movie history. Thank you! There’ll be more servings of spaghetti to come!